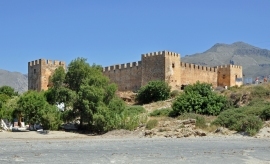 Crete is most likely one of the best known islands in Greece, and it is also the largest, which means that you should not aim to explore the whole island in a day or two. It would take you a whole month to really take in all the sights. A bit less than 650,000 people live on the island, and the two main centers are Heraklion and Chania. 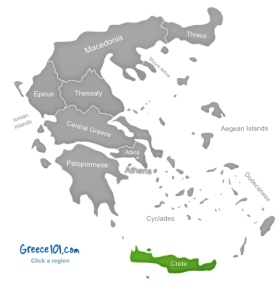 You either need to fly to Crete, and arrive in Heraklion or Chania, or take a ferry from mainland Greece. Crete has a good bus system, and it is fairly easy to travel around by bus. However, you can also take ferries to get from one end of Crete to the other. 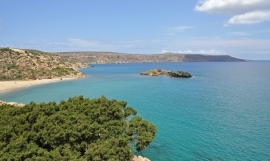 Crete is such a popular holiday destination for a good reason: It has marvelous landscapes (lush forests, mountains for great outdoor adventures), beaches like in dreams, ancients ruins, bustling towns, friendly locals, lots of good food and drink, and an activity for all kind of people. It does not matter whether you are a quiet person who loves culture and mythology, an adventurer who wants to climb some mountains and sleep under the stars, or whether you would like to have a holiday on a beach and have lots of parties in the evenings and nights. 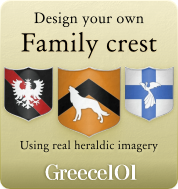 Crete has the right solution for everyone. What are the places you should not miss in Crete? Heraklion itself is not exactly the best city in Greece, but it is a great place if you would like to visit Knossos. 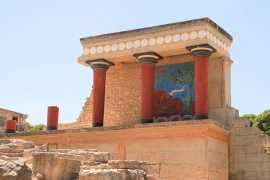 Knossos was discovered by Heinrich Schliemann (who also discovered ancient Troy) in 1900. 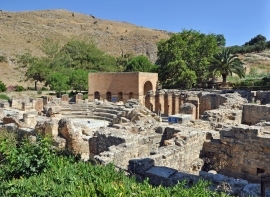 The ancient site is open to visitors, and if you love ancient history and old ruins, then you should plan to spend at least half a day in Knossos, as it takes a while to take in everything. Chania is the other big city on Crete, and has many beach resorts. However, the city also has many other things to offer. There is an old agora, a replica of a Minoan ship, a botanical park and some rather good museums. Did you ever want to visit the birthplace and childhood home of a god? Then you should head to the sacred cave Idaion as mythology says that this is the cave in which Rhea hid her son Zeus. 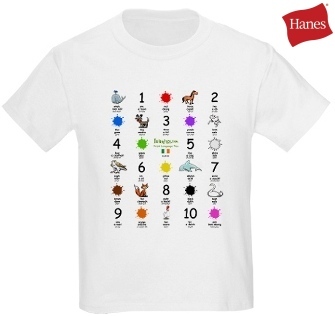 After all, Zeus' dad has a bit of a problem, wanting to devour all his kids. No wonder Rhea wanted to hide her son! It is a very interesting place to visit, and you should definitely respect the cave. 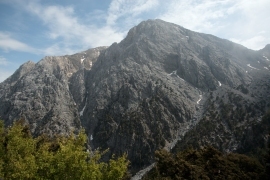 Crete is home to around 3,000 caves. So there is plenty to explore. Some caves have quite interesting histories attached to them. However, if you plan on going into a cave, then please do not go in there in your beach slippers. Wear good foot wear, and take a good torch with you. If you are the party type, then these two towns are the right places to go to. While the first has been replaced as party capital by Malia, it is still a great choice for party goers who prefer a slightly more mature crowd. This is a charming harbor city, and has some beaches where you do not have to fight for a good spot with other tourists. There are also some exceptionally good taverns in this town. Rethymno might not be a usual tourist spot, but the town has a lot to offer. The old town is mainly for pedestrians, and has many old buildings that date from as early as the 16th century. You can also learn a lot about the various cultures who have occupied Crete in the past by looking at the different styles. You should not forget to take a boat tour around Crete as the scenery from a boat is very nice, and you will be able to take some breathtaking photos. There are plenty of tour operators to choose from, so it is very likely that you can find a tour that suits you best.